Ever read a book where the principal character is a rookie detective in the first few chapters, by the middle of the book an undiscovered genius and by the end has attained the wisdom and influence of someone who has been on the job for 15-years? Be ready for the refreshing Det. Maeve Kerrigan, who is young, eager and makes mistakes. Author Jane Casey has written a character who is feeling her way along a job she is proud to have. She has instinct and complexity but isn’t dark and brooding, again refreshing. I read the first two Maeve Kerrigan books back-to-back: The Burning (2010) The Reckoning (2011). I had no choice really as I enjoyed the first one so much. And now of course there is one more: The Last Girl and suddenly I feel pinned to the wall. 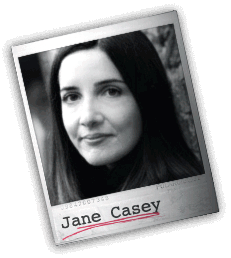 Jane Casey has been short-listed twice for the Irish Crime Novel of the Year. In addition to her Kerrigan series, Jane has written a young adult novel: How to Fall and her first book a stand-alone: The Missing. Off to check out the titles you mention. They certainly sound like something I’d enjoy. Thanks for sharing! You are welcome, and let me know what you think. I love discussing books, characters, plots etc. I downloaded the sample of The Burning and had to keep reading. I really like her voice. Thanks again for the recommendation. She does have a great voice doesn’t she. Plus doing the reading herself the interpretations of the characters (nuances etc.) are always spot on. Which actually shows you that I listened to her books rather than turned pages. What I probably should’ve said is that we were speaking at cross-purposes. I love this blog. My mom is an avid reader of crime fiction and I have recommended it to her. I am not sure that she has read any of Jane Casey’s works.